Today sees Liverpool entering a week that will almost certainly go down in history as a turning point. This isn’t the classic football turning point, the last minute goal awarded despite it looking offside that brings to an end a run of defeats. Nor is the other type of turning point the world of football often discusses, the bad signing that somehow turned a team making progress into a team going backwards. 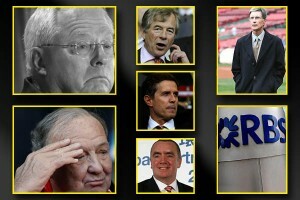 This week should see Liverpool’s boardroom change, and with it the ownership of the club. If it doesn’t happen this week, the events that make it happen will have already got well underway. Tom Hicks tried to change one of the boards last week – it’s not clear if that was the Liverpool board or its holding company boards – in an attempt to block the same of the club to NESV. The existing board, the majority of it at least, insist they are still in place and the sale was valid. Tomorrow the High Court will hear all about it as it asked to make a decision that will be key to Liverpool’s future. However it is believed that tomorrow’s case is one of two that will decide the club’s fate. Liverpool fans are not exactly having a good time of it right now, with results not going the way we’d like and the future ownership of the club remaining unclear. The following poll has just two choices for you to vote on and there isn’t a “none of the above” option. But please vote anyway. With the Broughton/BarCap sale process failing and c£300m RBS debt almost due, LFC and its fans are faced with two distinct possibilities. What’s your preference? 2) RBS take temporary control of the club on the proviso the club is passed on, as soon as practicable, to a responsible owner (this carries with it the possibility of LFC being placed into administration and a 9pt penalty being imposed by the Premier League). Liverpool are in a transitional period, new manager Roy Hodgson needs to be given more time to settle into the job, players were late back from the World Cup and either aren’t fully fit are haven’t been to enough training sessions for Roy to really know them yet. They are just some of the reasons put forward to try and explain an awful start to Liverpool’s league season; those reasons are rapidly becoming excuses. When the manager himself uses them it seems all the more worrying, but that is how Liverpool boss Roy Hodgson spoke after today’s 3-2 defeat at Old Trafford against one the club’s old enemies. Dimitar Berbatov’s hat-trick meant Steven Gerrard’s brace counted for nothing, although it at least kept the club’s goal-difference at ‘just’ -3 from the opening five games. In reality nobody expects a title challenge from Liverpool this season. This season there is an air that survival is the target. Not league survival, but survival as a team that might one day be able to challenge for the title again. Survival in the sense of not letting the gap between this club and Chelsea grow any wider than it already is. Hodgson will be well aware of this. After a period away from the public eye Christian Purslow put himself right back into focus this morning by speaking to the BBC about the speculation surrounding the club. According to the Liverpool managing director the board are now carrying out checks on those behind written bids for the club after which they intend to see the club sold “as soon as possible”. There has been a refreshing silence from the boardroom since the appointment of Roy Hodgson as manager. The club have left the football people to do the talking about the football; the senior management scaling back their contact with the media and a noticeable decline in the amount of “off record” briefings filtering their way onto the back pages, at least from the club. Actual interviews had all but dried up. Quite why Purslow decided to speak out today is a bit of a mystery. The club issued a statement on Friday night saying that as far as the sales process was concerned, “we will not comment on rumour and speculation.” Purslow himself today said: “It wouldn’t be for me to comment on the football side.” So what was left for him to comment on? As it was he spoke at length about both “the football side” and the sales process. His opinion on the football side should be of no importance right now, what matters far more is the part of his job he actually has the experience and qualifications to work on. Along with chairman Martin Broughton and commercial director Ian Ayre the Liverpool MD is about to be an important part of what will be one of the most crucial decisions in Liverpool’s history. Yahya Kirdi. Fantasy island, without the planes. Although a number of names have been put forward as frontmen for potential bids for Liverpool Football Club only a couple of them have actually gone on the record to admit any involvement. The most assertive in declaring his interest isn’t Kenny Huang of what is now known as “the Chinese bid” but Yayha Kirdi of what is now known as “the Joke bid”. Of course it’s not being played out as a joke by Mr Kirdi or his advisors, but it’s becoming more of one by the day. What he hasn’t said is who specifically it is he’s working for, other than some unnamed and therefore mysterious Canadian and Middle Eastern investors. This of course means there’s a fair bit of speculation about who they might be, at least from those who are giving him the benefit of the doubt that he actually has got some backers. Continue reading Yahya Kirdi. Fantasy island, without the planes. As the fourth pre-season under American ownership draws to a close Liverpool fans are still wondering just when ‘Snoogy Doogy’ might turn up to play in the new stadium that was supposed to open this month. George Gillett and Tom Hicks make up the ownership ‘team’ at Anfield, allowed in practically unhindered by supporters – and the previous shareholders – because they were going to bring the stadium that would bring in Snoogy after Doogy. They were going to do this without putting any debt on the club. In August 2010 Liverpool fans would be talking excitedly about what kind of view their new seat in the new stadium would give them, some of those fans in possession of a season ticket for the first time thanks to the increased capacity, which in July 2007 was hoped to be as high as 76,000 by the time the stadium opened. Over 30,000 extra seats and vastly improved corporate facilities would, with lucrative naming rights in place, bring in the kind of income that would give the owners their return whilst giving fans the chance to see their side compete on a level footing with their competitors at the top end of the table. The stadium would look brilliant; the good days would be back. Cue the sound of the needle slipping off a vinyl record. George Gillett claims firm interest from a potential buyer – but all, as ever, is not as it seems. As the clock ticks ever closer to the end of another deflating transfer window for Liverpool Football Club, Anfield Road has learned that George Gillett has informed Royal Bank of Scotland and chairman Martin Broughton that he has found a serious investor who is interested in buying the club. Anfield Road understands that George Gillett and LFC’s mystery saviour is ex-Syrian international footballer and millionaire businessman Yahya Kirdi. First linked with the club shortly after Martin Broughton’s appointment back in April it was intimated that the Syrian, who was using ex-Celtic player Andy Lynch as a spokesperson for the bid, had the support of “mystery billionaire backers from the Middle East”, a line which should send a shiver down the spine of anyone who’s kept an eye on either Portsmouth or Notts County under the stewardship of Sulaiman Al Fahim and Qadbak/Munto Finance respectively over the last 18 months. Continue reading You cannot be Syrias? What happened to the transfer budget? Losing any league game is a disappointment, but the disappointment is always magnified if it’s the first game of the season. If that season was supposed to be “the one”, that disappointment goes off the scale. It’s too early to write the season off, of course it is, but instead of getting the little boost many said we needed to push us that bit further, Liverpool have had another kick in the teeth. Xabi Alonso wanted to leave, his mind was made up well before the end of last season, and Rafa Benítez knew this. Florentino Pérez wasn’t actually the Real president, so Xabi wasn’t actually in talks with Real, but there was a genuine expectation at that time that Liverpool might even be persuaded to sell Xabi for as little as £18m. But £18m wasn’t Rafa’s expectation, he had a far greater say in transfers than he’d had before, and he wasn’t going to let Xabi go on the cheap. It doesn’t require a massive stretch of the imagination to see Rafa in a position where he doesn’t need to wait for Real to show their hand to know what cards they’ve got. If a player desperately wants to leave, and discussions to persuade him to stay don’t get anywhere, all that’s left is to try and get the best possible price for him. Few would argue that the £30m fee, plus up to £5m of add-ons, was less than Liverpool could have expected. Whilst Liverpool were holding out for Real to offer the right amount, negotiations were going on elsewhere. It’s to the credit of those involved in the talks at both clubs that Alberto Aquilani’s transfer from Roma was kept from the back pages right up to the eleventh hour. It looked like Liverpool had turned a corner. Not to be messed with in the transfer market, for buying or selling, Liverpool were going to build on that progress of last season. But that wasn’t the case at all. Liverpool didn’t even hand the manager a budget for transfers. Continue reading What happened to the transfer budget? The last time George Gillett gave an interview to Toronto’s sports-based radio station The Fan 590, the war for control of Liverpool FC went right back to the top of the headlines again; it signalled the beginning of one of the ugliest phases in the fiasco of the past six months. It was the first time one of the owners had admitted they had a problem with their partner since DIC’s hostile takeover bid began late last year. Gillett admitted his relationship with Tom Hicks had broken down some time before. The interview included allegations from Gillett suggesting he’d received death threats from fans. It also contained a vow from Gillett that he would not sell a single percent of his stake in the club to partner Tom Hicks. 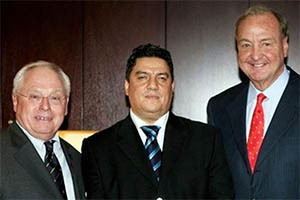 What followed was a public war of words which involved Gillett, Hicks, Rick Parry and David Moores, with Dubai International Capital sitting back and enjoying the fireworks, hopeful that when the dust settled they’d find both Hicks and Gillett standing pens in hand waiting to sign the shares away. That didn’t happen, in fact very little has changed at all in terms of the club’s future. The battle was potentially damaging, certainly to Liverpool’s reputation, although the team did play on as if nothing was going on off the field. All that heartache for fans, yet the club is still jointly owned by Messrs Gillett and Hicks. Fernando Torres has returned some of the compliments the Liverpool supporters have been paying him over the course of his electric first season in the English league. Torres signed from Atletico Madrid last summer and in scoring his 24th league goal on Sunday broke himself a record. He is now the most prolific foreign player in a Premier League debut season. There were times this season when it wasn’t the case, as the discontent during a run of poor form could be heard clearly from the stands, but on the whole Liverpool fans don’t turn on their own team: “The fans get behind the side even when things are not working out, and they are always there until the death. That is the major difference with football back in Spain. If a team is not doing well, then it is because the players do not deserve to be wearing the club’s colours.